Many different maps of Vvardenfell are available. Morrowind Satellite Map — A high-resolution map of Vvardenfell and Solstheim using the Google Maps API. Vvardenfell — Game map (also shown at right). Political map of Vvardenfell — A map showing regional influences. Quick-travel routes — A map showing fast-travel options, including Mournhold and Solstheim. Vvardenfell road map — For the traveler who likes to keep their feet on the ground. Old map of Vvardenfell — A map developed during the original design of the game, with significant differences from the final Vvardenfell map. Concept map of Morrowind — A concept map of the province. Released during the Tenth Anniversary of The Elder Scrolls. 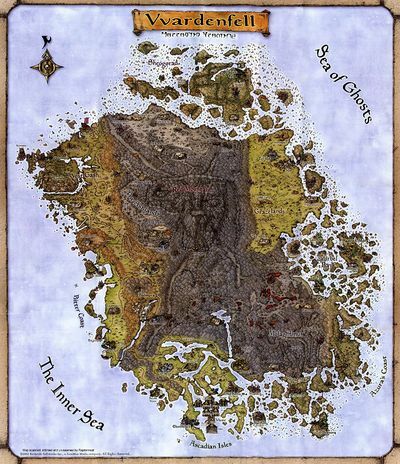 Elder Scrolls III: Morrowind @ Gamebanshee — This map was painstakingly created through actual travel over every portion of the land. The Imperial Library Cartography — Many different kinds of maps here. This page was last modified on 12 October 2018, at 20:21.